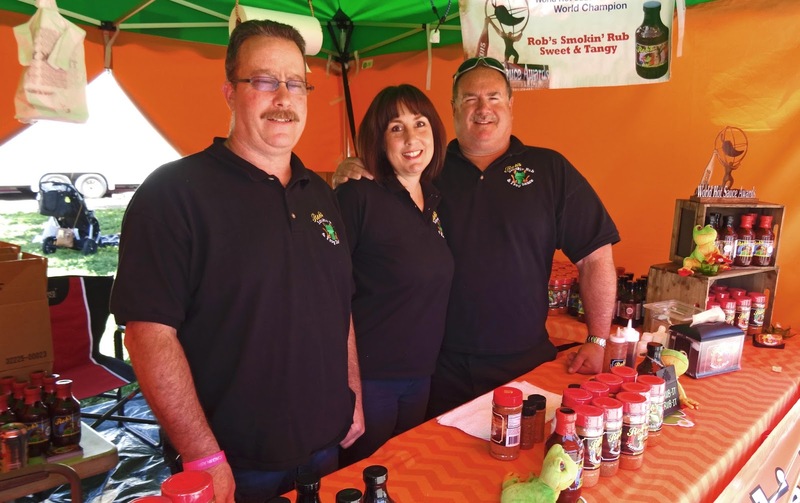 Rob Ryan of ‘Rob’s Smokin Rub’ has created and released a new bbq rub to add to his ‘Award Winning” lineup of bbq sauces and rubs. Rob’s tagline is;” Rub It With Rob's or Don't Rub It At All” ‘Rob’s Savory Chipotle Rub is a new flavor which boast to be a Competition Blend Sauce. We know Rob from barbeque competitions. He is a colorful fixture with his bright neon “Frog Sauce” shirts at many events. This new rub is comprised of many fresh ingredients such as; sugar, salt, brown sugar, chili powder spices, ground chipotle powder and natural hickory flavor. Chipotle is a smoked dried jalapeno which will add both a heat and smoky component to this rub. 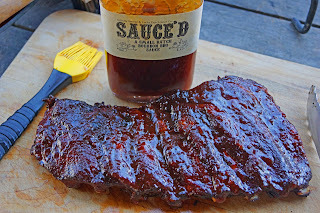 We purchased a bottle and decided to give it a test run on some ribs. The convenient combination pour slash shake top was opened to reveal an inviting aroma of smoky fresh spices. I dipped a finger in to taste and revealed a sweet and savory type flavor. My first impression was of salt and brown sugar with a hint of smoke. It finished with a slight heat from the chipotle. This flavor combination was pleasing from the get go. To be fair, rubs should be sampled on a protein with heat applied. We liberally dusted some St. Lois style cut pork ribs. A fire was stoked in our smoker. The ribs took a sauna at 240 degrees for three and one half hours. Look how beautiful they turned out. The sugars had caramelized with magical seasoning properties. I tried a rib before the finishing sauce. The rub ingredients transformed these ribs into savory treats. I thought the all-important balance of heat to sweet was perfect. We did finish these ribs with a bourbon bbq sauce. With the proper cooking technique Rob’s Savory Chipotle Rub very well could win a competition. They sure won at our dinner table.